Open to teams of 4 men, ladies or mixed playing an AM/AM Stableford competition. Maximum playing handicaps men 24, women 36 (90% Allowance) best 2 scores to count on each hole. Entry fee £80 per team, prizes presented on the day. Download entry form. Open to gentlemen having an official playing handicap (maximum allowance 24). Entry fee £20 prizes 1st to 5th plus nearest the pins presented on the day. Download entry form. A total of 87 players competed in the 2017 open which was won by Walton Hall member Mark Nye with a nett score of 72, runner-up was last year’s winner Peter Nye with a core of 73. 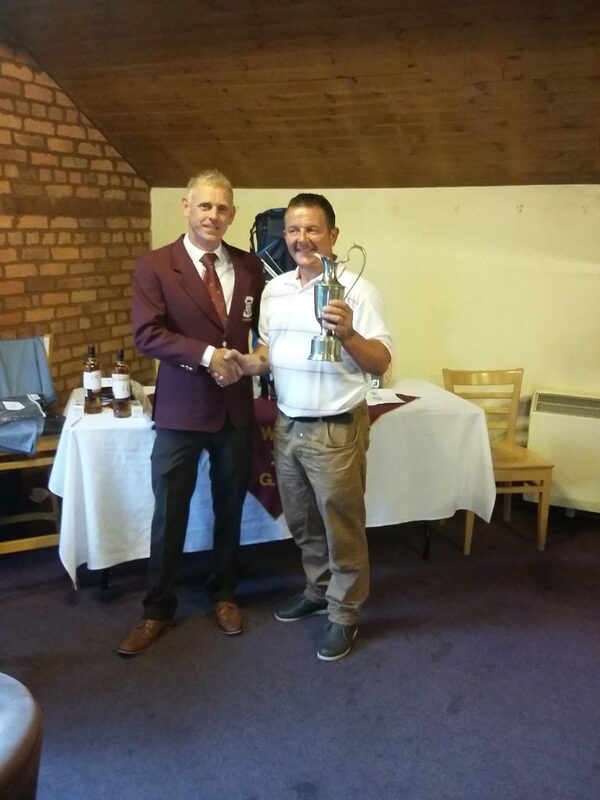 In third place was Phil Halligan a member of Aldersley Green Golf Club near Chester. The lowest gross was 79 scored by Paul Jones of Delamere Forest Golf Club. Winner Mark Nye being presented with the Warrington Open trophy by Walton Hall Captain Paul Butterworth.